Though the Donald Trump administration took more than nine months to finalise the South Asian strategy, the road laid by previous Obama administration, for a comprehensive and solid strategic partnership with India has further been cemented by the new US Secretary of State, Rex Tillerson. His visit to India on October 25 to 26, 2017, the first by a Secretary of State of the new Administration, attracted media attention because of his strong message to Pakistan on demolishing terrorist infrastructure on the Pakistani soil, has helped clear many cobwebs in India-US relationships. Taking advantage of the Obama administration decision to declare India as a Major Defence Partner Tillerson pressed for more defence sales from US companies to Indian armed forces. He especially pleaded for the F-16 fighter sales to India, which are competing with Swedish Grippen. India wants to produce the selected fighter in India under its ‘Make In India’ policy. The US Secretary also pleaded for F-18 fighter jets supplies to India. Before his departure for five nation tour including India, the US administration had already cleared the sales of Predator drones to India. India wants these drones, which will help in keeping a close watch over the Indian Ocean where the Chinese naval ships have been frequenting off late. 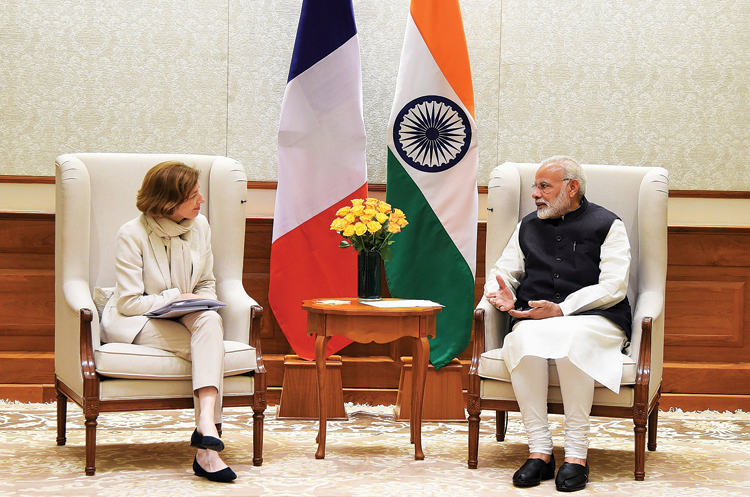 Besides Pakistan promoted terrorism in South Asia, his intimate conversations with top Indian interlocutors focused deeply on strengthening long term strategic partnerships. This will further broaden and lengthen the India-US strategic highways and sea lanes of not only South Asia but also the Indo-pacific region. 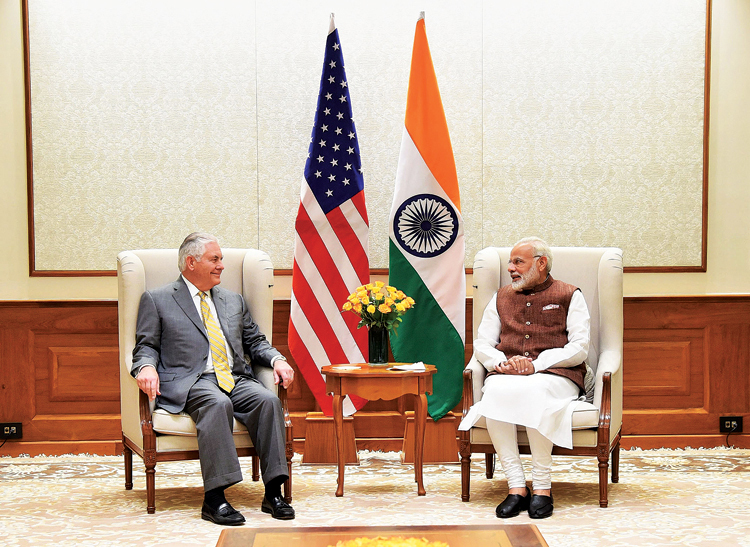 After giving a final shape to the South Asia strategy the US Secretary of State Rex Tillerson landed in New Delhi with a much comprehensive agenda for a strategic partnership, which is expected to last beyond this century. The partnership will not only be confined to bilateral one, but will be expanded to quadrilateral group, which is now beginning to unfold with the Japanese foreign minister statement regarding the proposal for quadrilateral talks between US, Japan, Australia and India. At the bilateral level, though, Tillerson talked of building a 100 years partnership, there are too many issues between the two nations which needs to be resolved to move towards a wrinkle free ties. India’s relations with Iran and American sweet and sour relations with Pakistan still are the major hindrances. Indian interlocutors very well understand, that the US has strained relations with Pakistan not because of India, but Afghanistan, which has caused the return of hundreds of body bags to US. Besides, the policy of appeasement of Pakistan has caused a huge financial drain to the US economy. When Donald Trump took over the US administration he raised this issue and warned Pakistan to desist from causing harm to US interests in Afghanistan. When the US authorities talk of terrorism it is focused more on Afghan based terror groups and Indian concerns are raised only in general terms. Still, the Tillerson visit hogged the limelight because of his open warning to Pakistan to take action against Pak based terror groups. These words are music to Indian ears, but the action on ground will tell to what extent US will go to pressurise Pakistan. With India-US economic relations deepening to the level of over $100 billion and as both the countries aim to expand this trade to the level of $500 billion within next five years, the two countries are on a strong wicket to further deepen bilateral defence and strategic partnerships. However, since the two nations share common strategic concerns regarding China and Indian Ocean, both the countries have been coordinating and discussing these in various bilateral and multilateral forums along with other like minded countries like Japan and Australia. It has often been said that US wants to deepen strategic ties with India in order to contain China. For this the US has opened its defence industry for Indian forces. Indian armed forces have in fact received arms and defence systems worth $15 billion in last one decade, Now the US wants more to sell and bag contracts for all the major requirements of Indian armed forces, which plans to acquire weapons and systems worth more than $200 billion in next one decade. India thus provide a huge defence market for the US defence companies. Hence, US emphasis on stronger defence relations between the two countries. With India designated as a Major Defence Partner, way has been cleared for US arms industries to easily transfer major high tech sensitive defence equipments to Indian armed forces. With rising security challenges from India’s neighboring countries, India also needs these systems, as India plans to extend its strategic reach beyond the pacific seas, which China wants to dominate and control. To further strengthen India-US strategic partnership and to counter China’s rising clout with its ambitious One Belt One Road connectivity project, Tillerson suggested that US and India partner to build road connectivity in the Indian subcontinent and port connectivity in the Indo-pacific. This can be construed as an alternative to Chinese OBOR. He wanted the two biggest democracies to join hands in providing a rule based and transparent financing mechanism for the connectivity projects. There are many issues of common strategic concerns to India and US, which will be discussed in depth during the 2+2 dialogue to be held shortly in New Delhi, as revealed by Indian External Affairs Minister Sushma Swaraj after meeting with Tillerson. The 2+2 dialogue envisages the simultaneous meetings of Indian Defence and External Affairs Minister with the US Secretary of State and Defence along with the top officials of both the ministries. This kind of 2+2 dialogue India presently conducts with Japan. Political and strategic partnerships will not achieve depth unless the people to people relationship between the two nations are also strengthened. Hence, Tillerson was told in clear terms that issues relating to H-1B visa and totalisation must be resolved at the earliest. Swaraj advised Tillerson publicly, “people-to-people contacts have played a critical role in the development of India-US relations. This is in part – this is most evident in our mutually beneficial digital partnership, driven by our skilled professionals. Secretary Tillerson has very correctly pointed out that no two countries encourage innovation better than the US and India. In this regard, we discussed the very significant contribution to the US economy of Indian-skilled professionals who travel and work under H-1B and L-1 visa programmes. Swaraj also said, “I have also sought Secretary Tillerson’s support for resolution of the long-pending issue of totalisation, and I have asked that nothing by the US should be done which will affect or adversely affect India’s interests. Innovation, entrepreneurship, and economic partnership have been an important foundation of our relations. With India US economic relations deepening to the level of over $100 billion and as both the countries aim to expand this trade to the level of $500 billion within next five years, the two countries are on a strong wicket to further deepen bilateral defence and strategic partnerships. The Tillerson visit has laid the ground work for this evolving strategic partnership which will have a significant bearing on the changing strategic equations of the 21st century.